At least it’s gonna be around here. In my efforts to tame the mountainous fabric collection I’m blessed to be in possession of, I shot off my mouth and said I plan to make at least 25 scrap quilts this year. Some of them are already started, and hiding amongst my UFOs and WIPs. Lots of them can be made from the scraps that I pre-cut into shapes and sizes, so they’re as good as started, if I just pick the perfect pattern. I’m setting aside more time this year to work on things of my own, AND to put some of my own quilts into my longarm schedule. I recently finished getting all my fabric organized into the tubs under my cutting table. 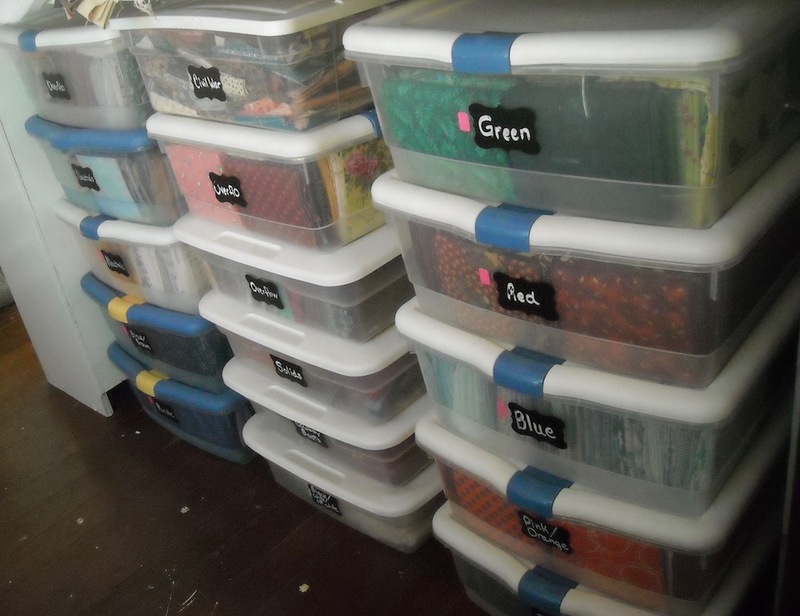 However, there is still one box of fabric that won’t fit in this location, so my intent is to use up enough fabric that my entire stash fits into these bins (and also to have fewer bins under there, too). A lofty goal, indeed. I also have several large bags of scraps, and two big tubs, that I’m working my way through, and I hope to have those gone by year’s end as well. So . 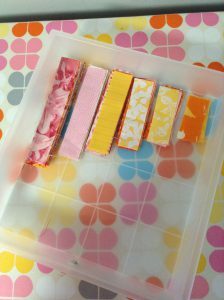 . . while sorting the scraps, I cut the smallest pieces into useable sizes and put them into these smaller bins of pre-cuts. I mostly use Bonnie Hunter’s Scrap Users System for this, altho I think I cut even more shapes and sizes than she does. I can do a more in-depth post on my pre-cuts later on, if you’re interested in seeing exactly how I do mine. Anyway, I’ve processed so many of the scraps that the lids won’t fit on some of those bins now, so it’s time to actually use the pre-cuts. Last year, I used up all my 2 1/2″ squares in a couple of scrap quilts, so I’m good there, but the lid wouldn’t fit on the bin of 3 1/2″ strips. About the same time I discovered that problem, my friend, Amanda Jean at Crazy Mom Quilts, posted THIS sweet project that she had just finished, and told how she did it! So I just yanked that bin off the shelf and went through it and cut enough pieces from those strips for TWO quilts like this. I’m doing one in all bright-colored scraps, and the other is more planned out with red, tan, and navy to be used as a quilt for my guild’s Veteran’s quilts project. I have the top of the first one finished, and am working on piecing the bright one. Scrap quilts go really fast, and they can be used as leader/ender projects for other things you’re sewing on. I have pieced entire scrap quilts as leader/ender projects. It’s like a bonus! 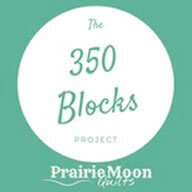 With my renewed dedication to spending more time sewing for myself this coming year, I think I can make this happen. Now to go through the UFOs and pick one to concentrate on so I can knock it off my list. I’ll pick one and show you later this week what I’ll be working on. What fun project have you started your year off with? You probably already know that I love scrap quilts. It is mostly all I make because the majority of my fabric is other people’s leftovers. I don’t mind at all. It gives quilts a texture and depth that you can’t get any other way. To start the year I am working on twin baby quilts (scrappy, naturally) for the recently born twins of my husband’s manager. Fabric already cut (2-1/2″ squares). Just had to color sort, pick a background and start stitching. Well, cool year ahead! I’ll love seeing all these, since I’m crazy about scrap quilts. Amanda Jean does come up with a lot of good idea. My vortex has been on the back burner, but it will have to come back out and get finished this year. I finished piecing the backing for two quilts today. What a good feeling! I see from “tracking” e-mails that my stash builder neutrals for the En Provence should be here tomorrow or the next day! Anyone else have fun the day after Christmas spending a gift certificate? Perfect? Right!! My list is on the wall and if I am diligent I will check off two things this month! Thank you thank you thank you for the encouraging challenge. One of the things I have gifted myself as the result of this challenge: I will not feel guilty if the list isn’t totally completed this year–if it were completed there would be not ufo’s or wip’s for next year. And I now see that I am not alone here with this new philosophy. I have been sorting through my scraps for a couple of days now. It’s a chore for sure! But I am determined not to buy any fabric this year unless I really, really need to! 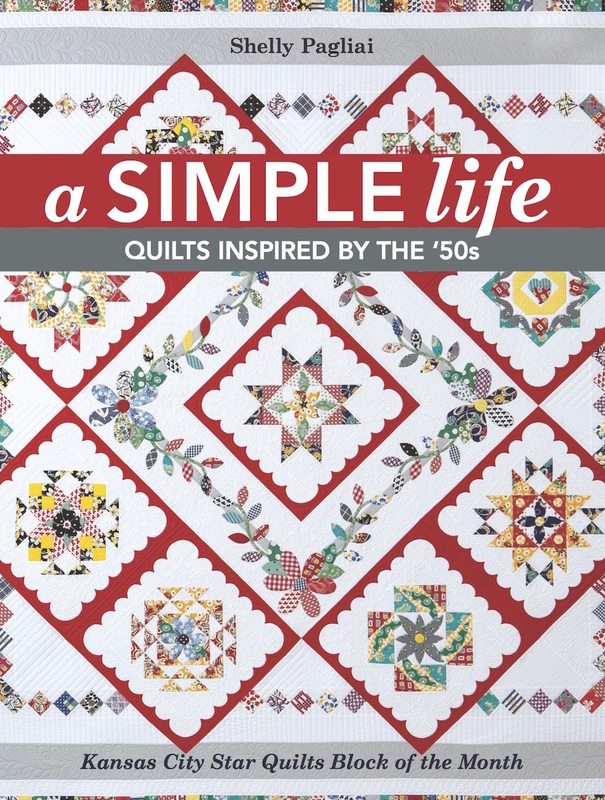 🙂 I have a couple of Bonnie’s books and hopefully it will give me some inspiration because I do love a scrappy quilt! 3 1/2″ strips (at least 6″) are good for making hourglass blocks when you put two right sides together[cut sets of 2]. they make 6 1/2″ unfinished blocks. 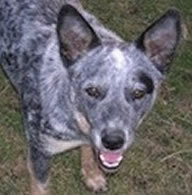 Bonnie’s current leader and ender challenge. okay as an official “Scrap Head” I can say I am doing 5 scrap quilts this year. 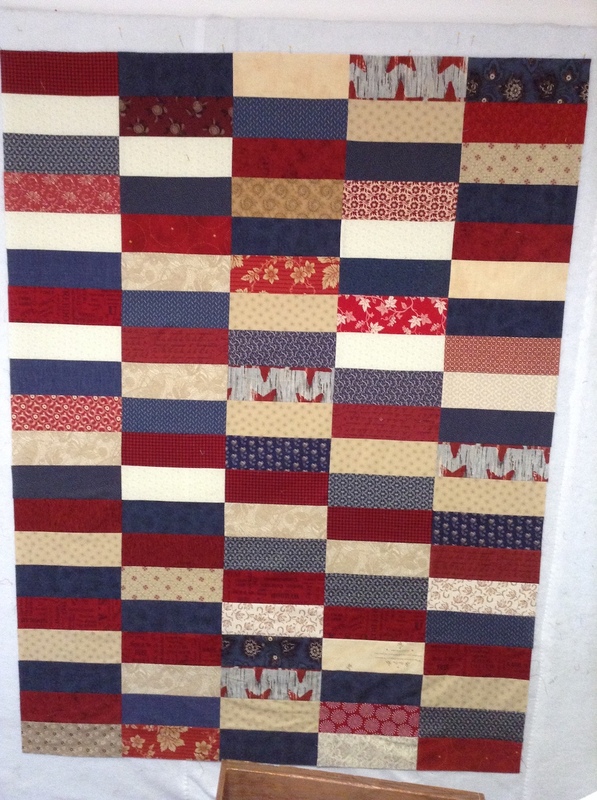 I’m working on Bonnie Hunter’s Mystery Quilt but I didn’t have the colors so had to purchase it. 🙁 However, I do plan on finishing the scrappy mystery from guild and I definitely need to tame the scraps! What a FABULOUS idea! I think I’ll follow your lead and work on getting my HUGE scrap stash under some semblance of control. I will be following your progress and referring my blog readers to your scrappy blog posts. 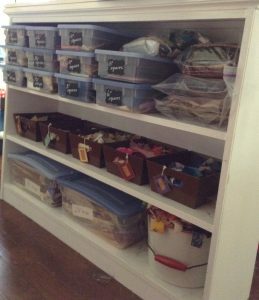 I would love to see how you do your scrap organization and storage. Mine is still getting the best of me!! Please please please. Thanks for the ideas! 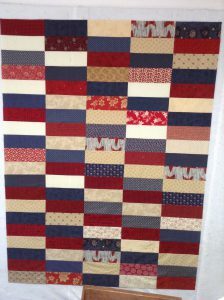 I am going to start with the log cabin scrap quilt, because that is my favorite. I have been working on a scrappy quilt and bonnies mystery quilt. I have about three scrappy patterns lined up to work my way through as leaders and enders projects. I love seeing how people organise their stash – I’ve also implemented Bonnies system recently. enjoy reading about how you sort & cut your fabric.. This may seem so basic but wondering how many colors do you break it down into? Do you separate out holiday & baby prints? What size totes do you use? 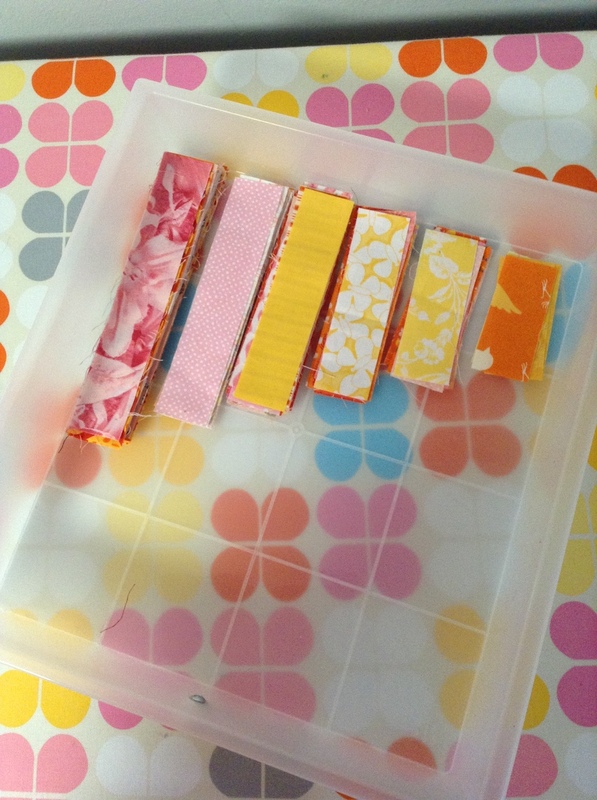 Do you find totes easier than plastic drawers? Can’t wait to start some scrappy quilts! I bought 2 major heavy duty shelving units for my fabric in bins. They will hold 5,000 lbs each. Most people who do not sew,do not realize how heavy fabric really is. I have 9 big bins/totes to sort through. I am a fabric hoarder for sure. Although I am somewhat organized I feel I need to get rid of a lot and or use them up. I am currently finishing a moose quilt from KeepSake quilting I’ve had for 2 years. 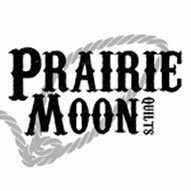 When I am done I will finish my 3 quilt tops for one of our Indian Tribes here in Maine. Then I hope to finish the 5 baby/crib size rag quilts I have all cut out. Also for our Indian Tribe. I think I will get hubby to help on those. Daughter has offered to help with sorting all my fabric and transferring them to clear bins so I can see the fabric. They will be labeled so we both can see what is in them. Seeing as I am starting my last semester in collage in a couple of weeks I need to get myself in motion. Today seems like a good day to start. At least put the shelves together. Although I am 74 I still like to learn. Your never too old to learn. But I am anxious to finish this 3 year course. Taking a year off to catch up with everything here before I think about what’s next on the learning curve. So that’s about it for now. Unless any life interruptions happen I think I can accomplish much this year, at least I hope so. I love that you are 74 and still loving to learn. I think that quilting is one of the best ways to forever have a new learning challenge in process. Well, right after tackling college, that is. I’m currently working on UFOs again this year. Finished a quilt yesterday and finished another quilt top today. Hoping I can keep the momentum going. Partly because there are several new quilt projects that I want to start this year.